Some years ago ITKF was a member of AGFIS. Now it is not recognised. Same destiny as Chatolic sports. This year it was: 14th World Traditional Karate Championship in Lithuania, Vilnius 11-12 OCTOBER, 2008. 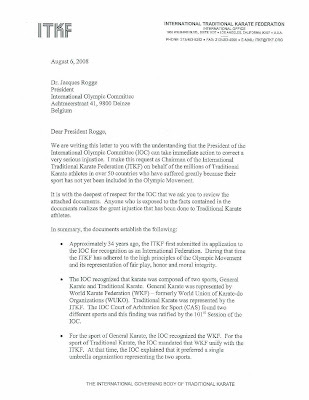 But oops - there is very strange thing - on ITKF site - 2008 European Traditional Karate Championship was canceled in the same year of World championship. 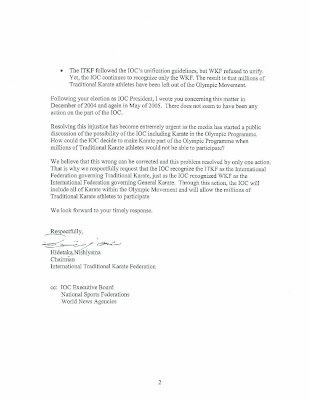 ITKF letter to Mr. Jacques Roggee - president of IOC - for traditional karate to become again AGFIS recognised.